They taught us how to make the frosting 40 years ago when I was in cooking school. It's powdered sugar and shortening. Oreo originally used tallow and lard. Hydrox used vegetable shortening. I got my copy of the January 2014 Consumer Reports Magazine this afternoon. There was an article about Oreo cookies and it claimed that the white filling "lacks milk, butter, eggs or any other dairy component...Oreos contain about twelve ingredients, the last being cocoa." This is scary stuff!! Lots of things don't taste like they used to because corporations have changed the ingredients--all to save $$$ while we are charged out of the you-know-what for these changes. I preferred them over Oreo's ! The cream was sweeter I thought. We frequently got Hydrox cookies instead of Oreos, and I'm not sure, as a kid, I paid much attention to the difference in taste, but they may have been a little cheaper. As to the taste of the chocolate cookie part of an Oreo tasting like chalk, I don't know, but it doesn't tast much like chocolate, either. Without the filling, it would be nothing! Our entire family much preferred Hydrox. To us, they were sweeter and crispier and just better tasting. Am I the only one who thinks the chocolate part of Oreo's taste like black chalk? I had been eating Oreo's for quite a while (relatively) when I first had a Hydrox. So, no matter which cookie actually came first, Hydrox will always be "Brand-X" to me. Interesting, Doot. According to Wikipedia's Oreo entry, Sunshine's Hydrox hit the market in 1908, four years before Oreo. It says Nabisco launched Oreo in 1912 as a Hydrox imitation! 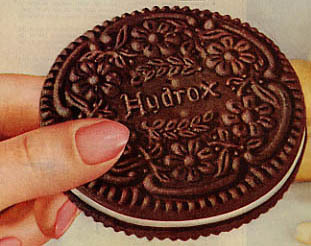 I always considered Hydrox to be a "Brand-X" Oreo. Oreo celebrated their 100th Anniversary earlier this month. Here's another vote for that crispier, dryer-tasting chocolate cookie part of Hydrox, vs. Oreo. Poor Sushine Thousand Window Bakeries! Always coming out second vs. Nabisco. I agree! They had a crispier cookie. Hydrox came back for a limited run last winter here in New Jersey at least. They taste better than Oreos, if you ask me.